This article is based on Episode 24 of the Little Red Podcast, focused on a panel at the Association for Asian Studies featuring Louisa Lim, Christian Sorace, Maria Repnikova, Xu Bin, and Yi Kang. Throughout our podcast series, we’ve asked many of our guests to nominate what William Gibson, the man who coined the term “cyberspace”, once referred to as The Time Things Changed. When did China take a sudden illiberal turn, and what caused it? What are they responding to? Maybe Arab Spring, maybe the rise of social media. We have antibodies without a clear disease. My pick is an earthquake that hit Sichuan ten years ago. At the time, the Wenchuan earthquake was, like the Tangshan quake of 1976, seen as a potential watershed moment for China. 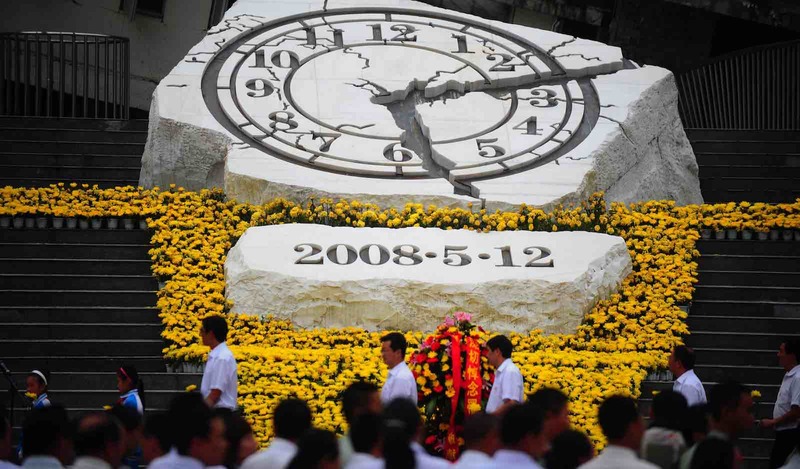 The massive tremor that struck western China on the afternoon of 12 May 2008 left five million people homeless and more than 85,000 dead, many of them schoolchildren buried alive in their classrooms. The quake was one of a series of disasters and missteps endured by Hu Jintao’s government in the lead-up to the 2008 Beijing Olympics. In January and February, snowstorms left millions (including myself) stranded over Chinese New Year, and riots and a violent crackdown in Tibet were followed by the public relations disaster of the Olympic torch relay, or “sacred flame” as it came to be known in the Chinese media. In its immediate aftermath, the earthquake seemed to offer everything but an illiberal turn. After initially trying to lock down reporting, the government opened up to the media. There was hope that a genuine civil society would emerge as Chinese citizens from all walks of life volunteered their time and gave generously. The internet was still fairly open, Chinese and foreign reporters worked side by side, and social organisations flourished. The government even took the unprecedented step of declaring a mourning period of three days for victims of the disaster, an honour previously reserved for “state leaders, high-ranking officials, fallen soldiers, and other human embodiments of the state”. Even Hong Kong media heaped praise on the regime. At the same time, a threat to the Chinese Communist Party’s chosen role of saviour was emerging, as it became clear that school buildings had crumbled to rubble while government offices remained standing. Was there a man-made element to this disaster? Having spent four years working in a county government in Anhui, “yes” was the obvious answer to me. Part of the remit of our agency involved irrigation and school infrastructure, and the words “tofu dreg construction” (dofu za gongcheng) were in daily use. I will never forget the first primary school I visited in 2004, where a classroom wall had collapsed due to a “strong wind”. No children had been inside, but a cursory inspection revealed cheap bricks laid sideways, joined by a sand mixture in which only tiny traces of cement were present. Cutting corners left more money in the builders’ pockets, and the funds provided per square metre were always a fraction of those allotted for county government buildings. One irrigation official likened his job to “shaving”: by not building a canal properly in the first place, an endless pipeline of work was created for his friends and relatives who won the contracts to undertake repairs. Wafer-thin rebar and shoddy concrete found in Sichuan’s collapsed schools suggested a similar philosophy at work. Despite this threat, and despite the efforts of individuals such as artist Ai Weiwei and local investigator Tan Zuoren, the regime was able to not only suppress negative reporting but also repair its moral image in the run-up to the Olympics. This was achieved partly by heavy-handed methods, including the imprisonment Ai and Tan, banning unofficial mourning, and conducting “thought work” through “gratitude education campaigns” for the “gift of reconstruction”. Look, if I give you a gift and it’s not what you wanted, it’s not what you needed, I didn’t even consider who you are at all, but I give it to you, is it still a gift? And on top of that I force you to profess your gratitude to me. For us, the earthquake was a blessing in disguise, because the houses collapsed and did the hard work of demolition for us. Now we can simply move the peasantry into these new apartment buildings and into a new urban lifestyle. The methods involved in the CCP’s current “war on poverty”, which involves a vast resettlement industry targeting millions of farmers, to an extent was born in this disaster. The largest quake to hit China in more than 30 years allowed, or forced, the Chinese state to bring together pre-existing elements of authoritarian governance and refine them. President Xi Jinping is often credited with China’s illiberal term, but the seeds were planted when he was Hu Jintao’s heir apparent, charged with keeping a lid on things in the lead-up to the Olympics. Although the lid is still firmly on, the question remains of how to deal with the pent-up steam.